Hinged cultuer tube storage box with handle is made of premium grade polypropylene. A locking clasp helps to keep most samples in place if tipped over. Autoclavable. Accommodates 16.5 x 100 mm tubes with plastic plugs. 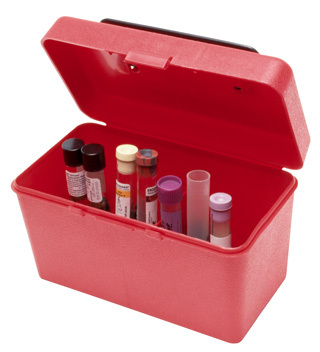 Also holds most blood collection tubes and the 10 mL frozen specimen tubes(16 x 85mm) Maximum tube size 16.5 x 110 mm.. Box measures 7.7 x 4.5 x 5 inches. Box features a carrying handle with textured sides for non-slip handling.